Story by Julia Steele. Photos by Dana Edmunds. For centuries the islands of Hawai‘i were ruled by ali‘i nui, great chiefs who were sovereign over shifting kingdoms. Battles for land bred skilled warriors and expert diplomats. When Kamehameha I united the Islands and declared himself king, the conflicts settled. But a new challenge had just arrived: Captain Cook had put Hawai‘i on the global map. Kamehameha I was the first of eight monarchs to rule Hawai‘i as it forged ties with the wider world: From 1795 to 1893, Hawai‘i’s sovereigns presided over a country that would become one of the most active and progressive on the planet. At a time when colonial powers were snapping up countries, Hawai‘i’s rulers cultivated the kingdom’s independence, gaining international recognition as a nation in 1843 and establishing over a hundred diplomatic posts around the world. In 1865, taking a cue from a European tradition that stretched back to the Middle Ages, Kamehameha V created the kingdom’s first royal order, a mark of favor to be bestowed on friends of the kingdom both at home and abroad. The Hawaiian monarchs created six royal orders in total and conferred them right up until the overthrow of Queen Lili‘uokalani in 1893; the orders’ lauded recipients varied widely, encompassing everyone from Japan’s Emperor Meiji to the deputy sheriff of Ka‘ū. King Kalākaua, who reigned from 1874 to 1891, created the Royal Order of Kalākaua to mark his election to the throne; it was given for distinguished services and merit rendered to the state or sovereign. Kalākaua was a true citizen of the world, the first head of state in history to circumnavigate the globe, meeting, among others, Pope Leo XIII, Queen Victoria and Siam’s King Chulalongkorn. 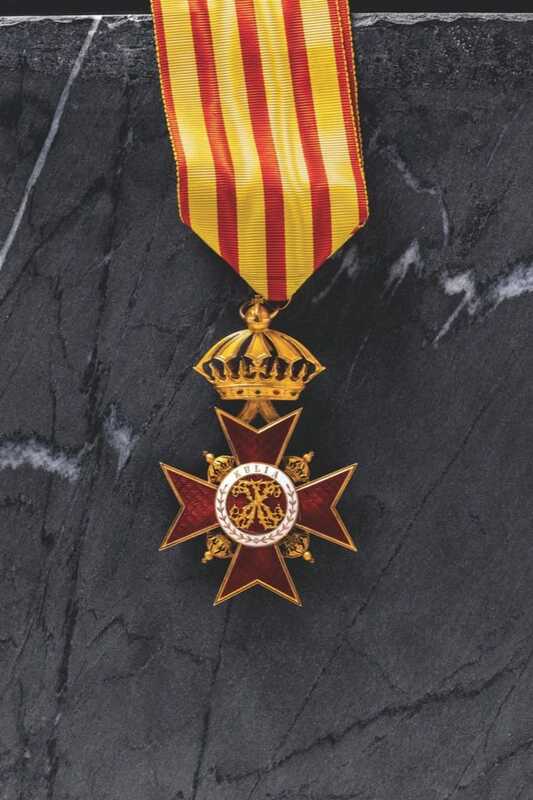 The Royal Order of Kalākaua had four classes (including the Grand Cross, seen on the opening spread), and the king conferred it on 239 people during his rule, both in Hawai‘i and abroad. His sister, Lili‘uokalani, conferred the order on fifteen, including the Belgian priest Father Damien, whom she visited in Kalaupapa where he cared for leprosy patients. “I beg of you, Reverend Father,” Lili‘uokalani wrote Damien, “to accept the … Royal Order of Kalakaua as a testimony of my sincere admiration for the efforts you are making to relieve the distress and lessen the sufferings of these afflicted people.” At right: Knight Commander, the Royal Order of Kapi‘olani. The Royal Order of Kapi‘olani (seen above) was created in memory of Kapi‘olani the Great, the high chiefess for whom Kalākaua’s wife was named. Initiated in 1880, it was given for services in the cause of humanity, science, art and services rendered to the state and sovereign; the words engraved on its obverse, Kūlia i ka Nu‘u, translate to “strive for excellence.” Henry Berger, bandmaster for the Royal Hawaiian Band, was one of the Hawai‘i recipients. Berger arrived from Prussia in 1872; by 1879 he’d become a citizen. Over the years he was much celebrated for his contributions to the country’s music: Berger led the Royal Hawaiian Band for decades, preserved in writing as many Hawaiian melodies as he could and worked closely with both Kalākaua and Lili‘uokalani, who were accomplished composers in their own right. He assisted the queen with her classic “Aloha ‘Oe,” and with the king created Hawai‘i’s national anthem, “Hawai‘i Pono‘ī.” In all, 180 people received the Royal Order of Kapi‘olani. Kalākaua created the Royal Order of the Crown of Hawai‘i in 1882 to commemorate his coronation. The order, with seven classes, was conferred on 235 people, among them individuals from Monaco, Sweden, Italy, Austria, Portugal and Persia. As far afield from each other as Hawai‘i and Persia were, they were not strangers: When Queen Kapi‘olani and then-Princess Lili‘uokalani traveled to England for Queen Victoria’s Golden Jubilee in 1887, they stayed in the same hotel, the Alexandra, as Persia’s royal contingent. In the latter half of the nineteenth century, the two countries were among the world’s few independent non-European nations, and the connection was significant; over the years fourteen diplomats from Persia received the Royal Order of the Crown of Hawai‘i. 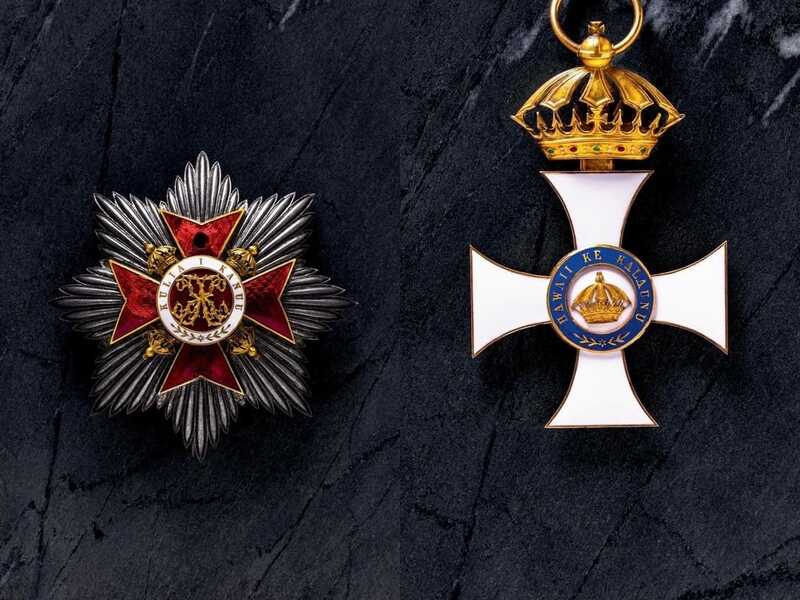 The order (seen above in the Knight Commander class) is also notable because it was the last of the orders bestowed by the queen before she was overthrown: James Dunn, Hawaiian consul to Glasgow, received the Companion class on November 3, 1892. The Royal Order of Kamehameha (seen above) was created in 1865 by Kamehameha V in honor of his grandfather, Kamehameha I. 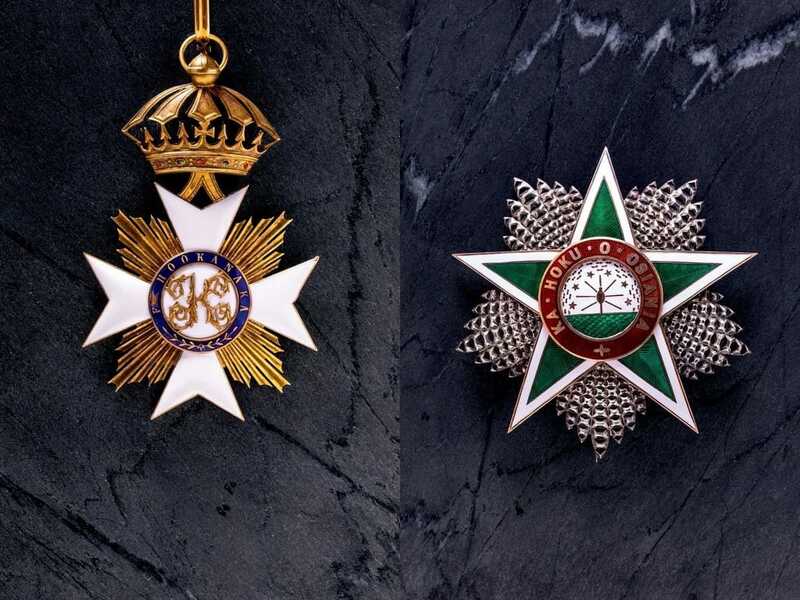 The order was divided into three classes, and none was higher in the kingdom than the Knights Grand Cross. Some of the world’s most powerful leaders were recipients: England’s Queen Victoria, Germany’s Emperor Wilhelm I, China’s Emperor Kuang-hsu and Russia’s Emperor Alexander III. It was Hawai‘i’s envoy extraordinary and minister plenipotentiary, Curtis I‘aukea, who presented the order to Alexander III at the emperor’s coronation in Moscow in 1883. I‘aukea was welcomed with great warmth, met with Alexander III twice and was invited to attend the premiere of Russia’s first opera. “We were placed in the box second to the right of the emperors,” he wrote, “about twenty feet away.” To thank the Hawaiian kingdom for the honor, Alexander III sent a warship to the Islands to confer on Kalākaua the diamond-encrusted Order of Alexander Nevsky, the highest decoration that Russia could award a foreign prince or statesman.